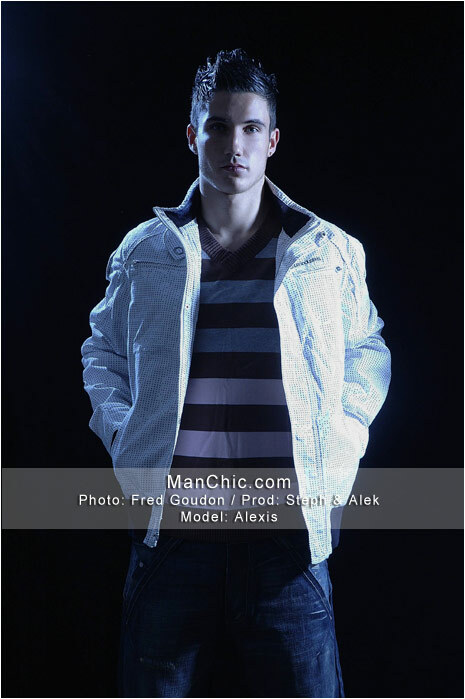 Please welcome to manChic a 23 years old photographer Fabio Lana from Italy. He has contributed this interesting story Bad News For Benjamin, in order to bring you an idea how to dress stylish this autumn. If you want to see more of his work please visit his internet site. The FLAUNT series is the most comfortable underwear aussieBum has developed to date. It was designed using soft form fitting modal fabric and features new waistband technology. The range is pure underwear luxury. So we decided to pick one of the hottest models in L.A. from Next Models, Brandon Waarbroek, bring him to our pool and make hit try those... and we had so much fun taking the photos. 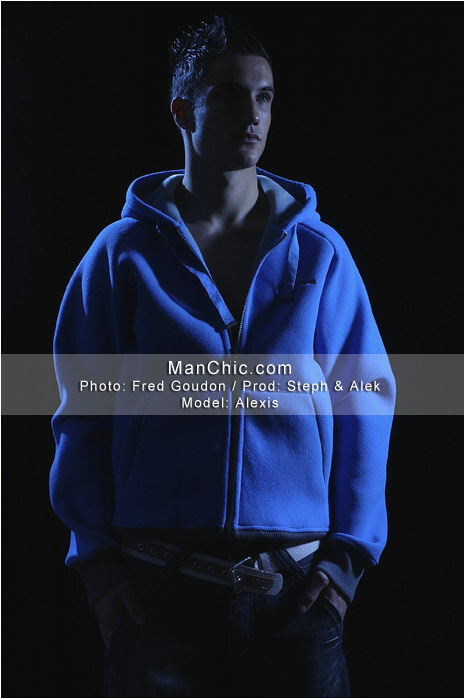 You will soon see the selection of images on AussieBum.com. A few months ago we went to San Diego to shoot some street fashion and swim suits. We brought together Jonathan and Kevin, with Fred Goudon behind the camera. As you can see the result is dreamy. The light was perfect and the music was great... The Brands Featured: Rufskin, LowTee, LASC, Gulity & Energie. The winter is all over the north hemisphere but we are always looking to give you tips how to look great no matter the season. 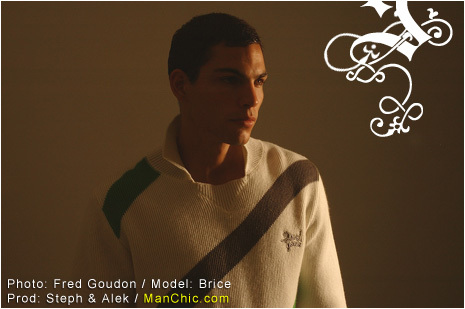 The model is ManChic discovery Alexis. 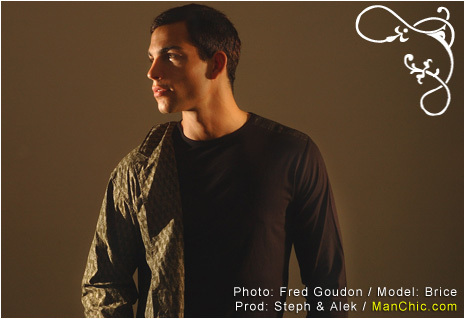 Photos are taken by ManChic resident Fred Goudon, assistant was Gregory Rossi, and style and prod by your hosts Alek and Steph. "After a long day and perfect rock & roll look just switching Energie t-shirt for a nice Sixty polo and a tie, and I am ready for a loud night out". And that jean you are wearing ? 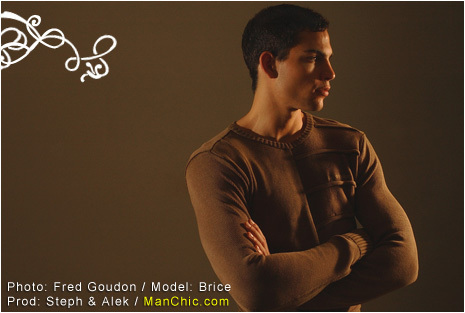 "Sixty biensure"
This was our first shoot with Nicolas, and Fred Goudon did a great job bringing out that boy next door look to the perfection. Coordination was handled by Gregory Rossi, and styling by Alek and Steph. It is not very common to see a model working on the set... well Brice played the game and helped us take this backstage shoots wearing nothing but underwear (GinchGonch). It is amazing how little color can do the trick. Photo Shoot took place in Fred's studio in the north of Paris, and we were happy to get this working atmosphere feel, while being able to take time and relax between the shoots. GinchGonch is the brand that brings the life into underwear. Go to their site to get more info about upcoming designs, and see some excelent videos.